Attack on Titan's third season has had a major goal of setting a new status for the series as the Survey Corps learned of the major political trickery going on and helped to overthrow the previous government. In its place, a new royalty was crowned as Historia Reiss, original to the throne, took her official place as queen of the country. Earlier in the season fans learned that Historia's past involved her changing her name to Christa after her mother was killed by the Anti-Personnel Squad. The Reiss family was originally the family in line to the throne ,where but the memories of the citizens had been changed and threw everything into question. 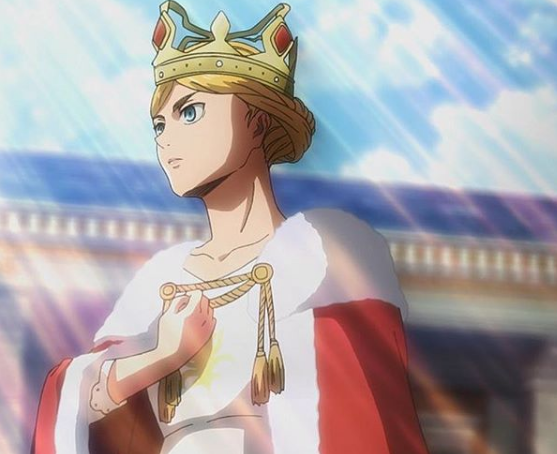 After the former king and royalty in charge through a military, Historia was left with the huge responsibility of being in charge now. To get the citizens to accept her, she joined the battle against her father turned freaking Titan, and even deal the killing blow. The fact that she deal with killing blow in front of so many people helped the citizens accept her as the new Queen, since she's a hero, but the problems won't stop for her there. Te road to her new Queen dom was difficult, and she even had to discard her past as a member of the Reiss family. But Historia's growth through the season indicates that not only will she be up to this new challenge, but she will exceed expectations.